Nonsemble is organised like a rock band, and we love to play shows. Whether they are in prestigious arts festivals or back yards. 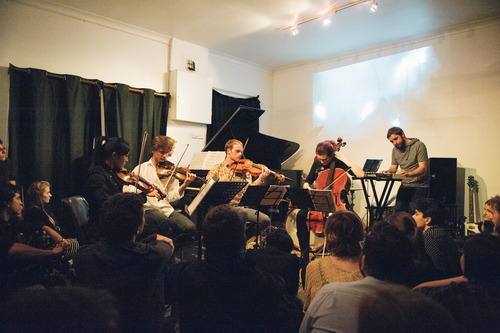 Our repertoire of Chris Perren’s original compositions along with other local and international new works strives to hit the balance point between challenging and accessible for general audiences. We can play fully acoustic or fully amplified, with or without our visual projections. To put us on your line-up email nonsemblemusic [at] gmail.com, or contact one of our co-managers directly: Kieran Welch (kieranwelch [at] gmail.com) and Flora Wong (flora.wong.violin [at] gmail.com). Nonsemble can play at your next event, wedding, or function. We have a sizeable repertoire of arrangements of indie classics including Sufjan Stevens, Boards of Canada, and Bjork. So if you’re looking for something with the refinement of a classical ensemble, but with a bit of an ear to the ground, get in touch! Our rates are reasonable and we can even arrange your favourite song on request. For event bookings email nonsemblemusic [at] gmail.com, or contact one of our co-managers directly: Kieran Welch (kieranwelch [at] gmail.com) and Flora Wong (flora.wong.violin [at] gmail.com).